ASSEMBLED and TESTED BOARD – $29.99 with Free Shipping USA only. Hello 2ALL. This is a fresh and new design of Lightning Protection for Antenna Rotors (LPR) by Ivan RA3WDK. 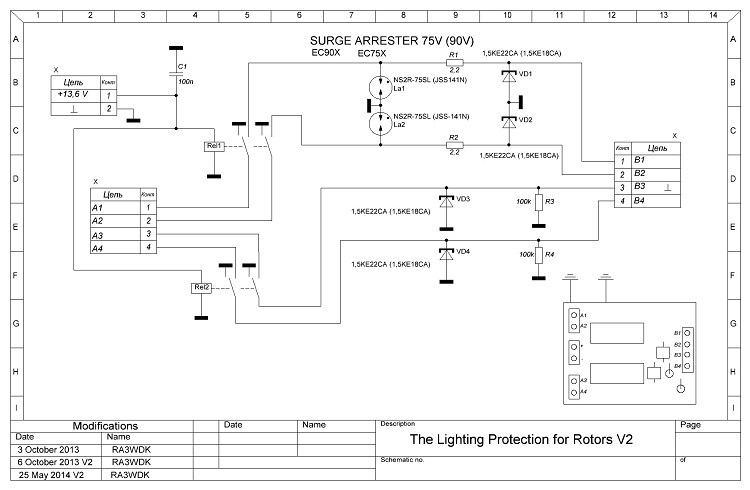 LPR – Lightning Protection for Antenna Rotors. control unit against the static and dangerous voltage during the lightning storm or thunderstorm. You need it for protection. Without the proper protection of your rotor and control unit the chance to get damage during a lightning is very high. There is a few important steps that needs to be done before rotor installation. Some people prefer disconnect the all cables during the lightning storm but that is only option and it’s not a right way to do. If your system is not GROUNDED or hasn’t any lightning protection the cable disconnecting won’t work. The lightning strike is the natural hazard. Stay smart! I hope you thinking about protection your antenna rotors and station. How many HAMs ground or disconnect their rotor cables? So much information has been posted on lightning protection for Rotor in Internet, but not many HAMs used those recommendations. Isn’t good idea! You have to be always prepared. It’s better spend $$ for protection instead spend your $$$$ for repairing and replacing. The primary goal in any lightning protection system is to control the massive energy generated during a lightning strike so it will dissipate before it can enter our homes. Lightning contains awesome levels of energy in a wide range of frequencies, and travels fast (1ns per foot) with very fast rise times. It can travel through the power lines, coax feed line, control lines, telephone, CATV or satellite coax and our equipment looking for the easiest path to ground unless we can provide a better path for it to follow. To control this energy, we have to provide a better path to ground than anything else around. A single, low inductance ground point system can ensure a simultaneous rise and fall of the currents across all of our equipment, so no current will flow across the equipment in search of ground potential. Build a ground system that uses conductors with low inductance and impedance across a wide frequency spectrum to provide a good path for the energy to follow. A wide and thin conductor like copper strap is better than wire or cable for longer runs. A heavy solid, rather than stranded, wire will work if the connection is direct and short. Even with a well designed ground system, some of the current generated during a lightning event may flow along feed lines, control and equipment grounds and AC power lines. Lightning protectors should therefore be used on all of these lines before they enter our house. Lightning protectors work by diverting the surge to a low inductance ground path that we must provide. Easy to install, have TVS-diode/Gas tube Arrestor and relays to disconnect the rotor from control unit. TVS diode shunts RF current and voltage over 18V, Gas Tube Arrestor shunts voltages over 80v. The relay connects the rotor only for work period. 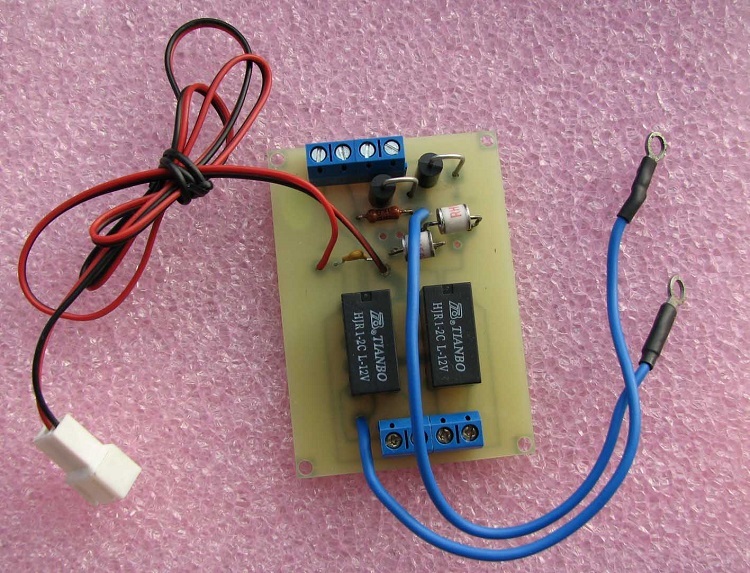 It’s very simple circuit but could save your time and money. Amateur radio equipment should be grounded in the single ground point (better outside of house/shack). You must connect PLR ground wire to that ground point. TURN OFF and UNPLUG the control rotor equipment and TRX (included PS) before start grounding. Im interested in your lpr lightning protection for the YAESU G-800DXA. If you sell this as a kit or all ready put together on a circuit board i would like to put this on my rotor before i put it in sue. the one from DX engineering is to expensive for my blood. yours sounds perfect for me i have water proof boxes of all kinds to put the board in. please let me know what i could do to get this. I am interested in your lpr to provide lightning protection for an outdoor TV antenna Rotor. I have a Radio Shack (Archer)1225 ,3 wire rotor system. I can supply a separate 13.6VDC to operate the relays. I would locate the device outdoors in a weatherproof enclosure, close to ground level at the cable entry point and tie to the system ground point. Looking at the schematic, it appears your device will work well for this application. I see your latest update was in may of this year. Please provide purchase information if the item is available for direct purchase. Thank You. Yes it will work with your rotor without the problems. Just wire it up and power it. The price would be $30 shipped to your door by USPS First Class 3 days. If you fine with this please send your payment to my paypal account alex_nersesyan@yahoo.com and write in the comments “PAYMENT FOR LPR”. Thanks for your interest. 73! Thank you for the quick response. I appreciate it very much. Payment has been sent. Got your payment, thanks. Will ship it tomorrow. This LPR product seems to only protect half of the Yaesu rotor system. In fact, pins 1, 2, and 3 are only the position indicating potentiometer. Lines 4, 5, and 6 are power supply lines that also connect to the Yaesu rotor control circuit board and power supply board, and have NO protection in this LPR product. What do you suggest be done for protecting lines 4, 5, and 6 in the Yaesu rotor system? I would like to buy (2) LPR, ASSEMBLED and TESTED BOARDS – $29.99 ea. How do I do that since it is not listed on your on-line store? Just sent you payment for (2) LPR units via PayPal. Read your instructions of July 31, 2014 and did the same. You do not have a diagram for the Hy-Gain T2X rotor. 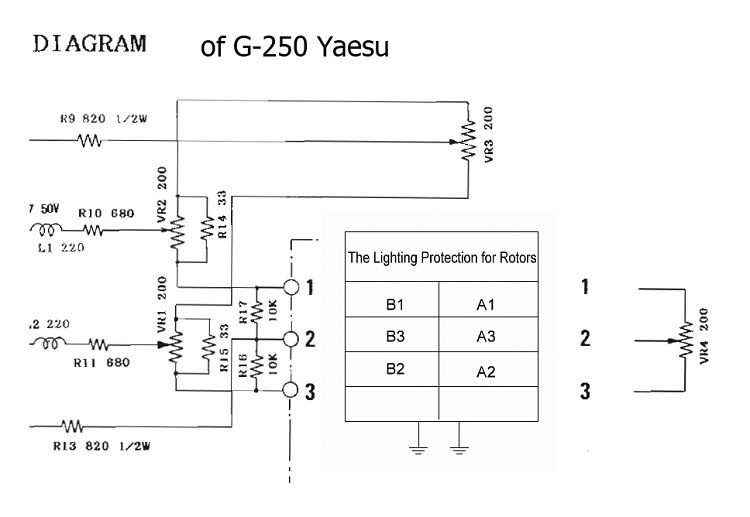 All I have been able to find are the diagrams for Yaesu rotors. I would like to order the Lightning Protection for Rotors verson V2. I am located in Sweden. Hi. Please send an email to alex@k6vhf.com Thanks. The LPR that just arrived looks good! 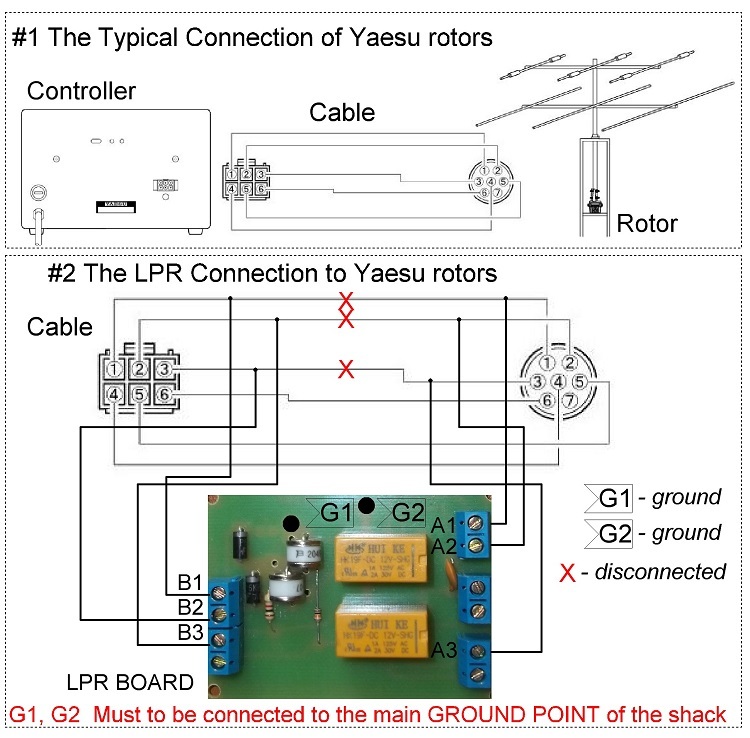 I notice that the 2 motor connections for a Yaesu rotator are not included in the LPR and so are not protected. Do they need protection also? If so, how would I do it? Do I need to buy a second one? If you have rotor with elevation then you would need two boards. Thanks. WIll the LPR work on the Alliance HD-73 rotor? It can work with all rotators. I just need a schematic to verify. Thanks.